The Dalai Lama has been an icon of the Buddhist religion and a man considered by millions to be very wise, so when he has something to say, it is worth taking note. The 14th Dalai Lama had some words of wisdom regarding the immigration troubles facing much of Europe. During his visit to Malmo, Sweden for a conference, he said refugees should return to their homes and help rebuild their own countries because "Europe belongs to Europeans". The spiritual leader hails from Tibet originally but now lives in India where he is a practicing monk of the Gelug school which is the newest school of Tibetan Buddhism. The man's entire life has been based on the Buddhist religion and he has lived many decades as a monk. The Dalai Lama is 83-years-old and has a knack for getting to the heart of world issues. 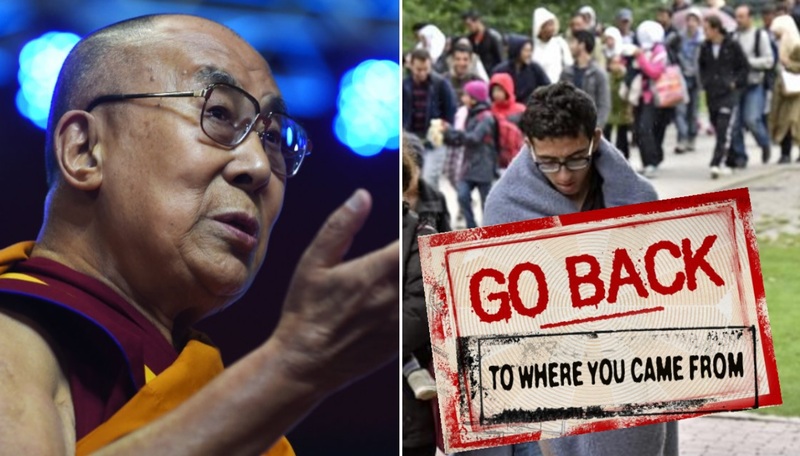 While speaking at the conference, Dalai Lama acknowledged that Europe had a duty to help those seeking asylum, but he also insisted that they too do their part. Despite his no-nonsense opinion of refugees entering Europe, he was also careful to explain that Europe was "morally responsible" for helping a "refugee really facing danger against their life". That sounds like the ideal approach but how does one differentiate between those asylum seekers who are truly in danger and those are seeking to enter for criminal purposes? That is a huge part of the problem the United States is facing as well, the vetting of refugees has been a hot topic of debate during the Trump presidency and even during the Obama era. Just three days before the Dalai Lama's speech, Sweden's far-right populist party began making gains and taking the lead in the general election. The party in second place is Prime Minister Stefan Lofven’s Social Democrats and the opposition conservative Moderates in the Nordic nation with the anti-immigration party coming in third. A little history of the Dalai Lama shows that he himself was once a refugee when he was forced to flee Tibet in 1959 after he was chosen to become the 14th reincarnation. The Tibetans rejected Chinese rule and Dalai Lama was forced to travel across the Himalayas in an attempt to reach India, a 15-day trek. To this day, he remains in exile in India but is currently on a European tour. His next stop is expected to be tomorrow where he will meet with dozens of victims of alleged sexual abuse at the hands of so-called Buddhist teachers. The meeting is believed to be the first such gathering of its kind. Victims of the sexual abuse started a petition to get his attention and arrange a meeting earlier this week. The Dalai Lama heard of the petition and agreed to come to The Netherlands where he is scheduled to give two days worth of lectures in Rotterdam. The victim's petition said, "We found refuge in Buddhism with an open mind and heart until we were raped in its name." The petition garnered nearly 1,000 signatures. When the petition reached the office of the Dalai Lama, he responded saying he would talk to the victims during a "short audience" scheduled for Friday afternoon. An official from his office wrote in response to the victim's petition, "His Holiness the Dalai Lama was saddened to learn of the sexual abuse suffered by students of Buddhist teachers." The letter added the Dalai Lama "has consistently denounced such irresponsible and unethical behavior. Such misbehavior was intolerable and must stop." The Dalai Lama also showed he is willing to go one step further and expose the accused Buddhist teachers saying if the warnings were ineffective then "students would have no other recourse than to publicize such disgraceful conduct, criticizing perpetrators by name." The victims will get an opportunity to personally hand the Dalai Lama their written testimonies which are no doubt filled with tragedy. After spending four days in the Netherlands, his tour will take him to Germany. The iconic Dalai Lama is revered by millions of Buddhists around the world and is considered to be similar to historical figures such as Mahatma Gandhi and Martin Luther King. But when it comes to western, liberal media, his recent comments are likely to get some negative attention and accusations of racism. Social media users have already begun to condemn the Buddhist leader for his simple remarks which are common sense to most of us. One Twitter user even called the Tibetan monk a "KKK sympathizer" and "evil neo-Nazi". Others defended his words pointing out how he was careful to clarify his compassion for those fleeing war-torn homes. Another social media user accused the Dalai Lama of joining the "far right" simply because he said he believes that refugees should ultimately rebuild their own countries. That sounds like a perfectly reasonable idea and the correct one when you consider the mass immigration problem logically. I'm sure I will get called a racist and a neo-Nazi as well for agreeing with him, but I think that most people with common sense would agree too. I am disgusted by the comments by Is tressy TV stars my God my great God as nothing to to with the cosmetic surgery and has to weirdos and they're interesting the strange opinions that affect millions of people . I think it's awesome! You tell'em dali lama! The entire reason distinct cultures even exist is because people self-segregate. Mass immigration destroys entire cultures. Spirituality cant exist without history, and culture, nice to see someone that understands that.